It is common for the surfaces of streets, sidewalks, and parking lots to be irregular. It is not the duty of the landowner who has custody or control of these areas to eliminate all variations in elevations existing along the countless cracks, seams, joints and curbs. These surfaces are not required to be smooth and lacking in deviations. Such a strenuous requirement would be impossible to meet. A landowner or person having custody or control of a street, sidewalk or parking lot will only be held liable for those defects which present an unreasonable risk of harm. Whether the risk of harm presented is unreasonable is determined by an objective standard of what a reasonable person would think, not what the plaintiff who is injured believes. While there is no clear cut test to determine whether a walkway presents an unreasonable risk of harm, the test usually applied is whether the walkway was maintained in a reasonably safe condition for a person exercising ordinary care and prudence. Courts consider several factors in making this determination, including the location of the alleged defect, the victim’s familiarity with the area, the size of the hole or imperfection, and the victim’s use of ordinary care. Likewise, a state or public entity is also obligated to maintain its sidewalks in a reasonably safe condition. The burden of tort liability from a defect in a public sidewalk lies generally with the public entity and not the adjoining landowner. An abutting property owner is not generally responsible for the repair and maintenance of a public sidewalk except where the defect in the sidewalk was caused by the landowner. Where sidewalks are not provided, any pedestrian walking along and upon a highway shall, when practicable, walk only on the left side of the highway or its shoulder, facing traffic which may approach from the opposite direction. A pedestrian is not required to constantly observe the surface of the walk or to exercise the care that would be necessary in traversing a jungle. When an action is commenced against a public entity for damages resulting from a defective roadway, or sidewalk, the plaintiff must prove that the defendant owned the land or had custody of it, that it was defective in that it created an unreasonable risk of harm to others, and that the defendant had actual or constructive (should have known) knowledge of the defect or risk of harm and failed to take corrective action within a reasonable time. 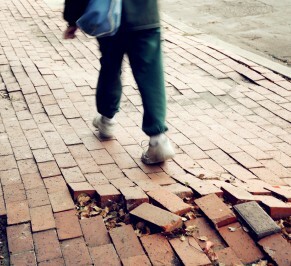 These cases often require the use of architects, engineers, and highway designers to establish the defective condition of the sidewalk or roadway and the failure to comply with national and local codes or ordinances governing the proper construction and maintenance of sidewalks and roadways.